"..I see everything that made me lying around in invisible pieces. When I look too hard, it goes away. And when it all goes quiet, I see they are right here. I see that I'm a little piece in a big, big universe. " In November 2014, Citizen scientists converged on Cocodrie's Louisiana Universities Marine Consortium (LUMCON) to share ideas about tools and techniques for exploring spontaneous ideas of discovery. Coming from the concrete jungle of obliterated New York City's Brooklyn estuary, I was curious to see what was happening to America's last great natural resource, the Mississippi delta wetlands, and how citizen generated exploration tools could help. The digital mapping revolution of the Internet has revolutionized the complete stranger's access to local knowledge of landscape change. With a couple of clicks of a mouse, I had located a historical map showing wetland loss around the Cocodrie marsh system. Purple on this 1987 US Army Corps of Engineers Map represents a half century of wetland marsh loss between 1932 and 1983. 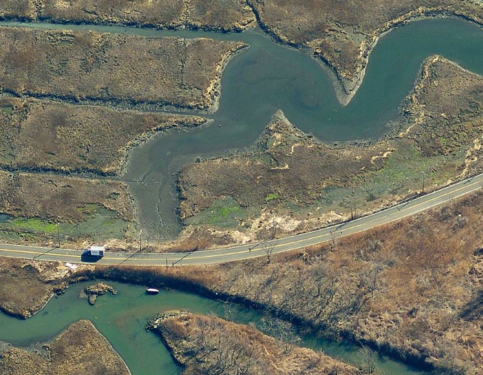 A wonderful kite camera panorama by Chris Fastie shows not just the urbanization and landfilling from human settlement, but also gradual conversion of former marsh grass areas to mudflats. 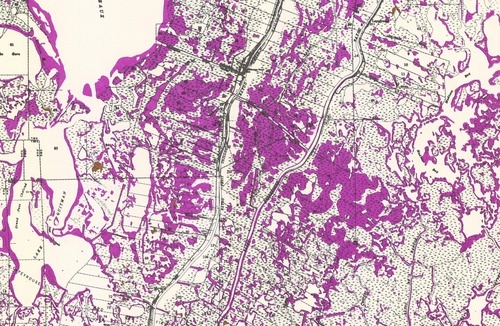 I was particularly intrigued by the massive blobs of purple on the upper part of the map. What could be causing such massive changes in the landscape ? How could I in the less than 48 hours I would be here find out more ? Spontaneous research allows citizens to quickly explore hunches that may lead to meaningful questions and even significant policy findings. How can we not look too hard, and yet "see the invisible" ? 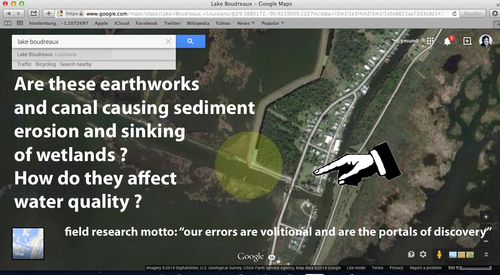 A quick glance at Google maps shows that canals had been dug right in the center of the purple wetland loss zone. Along with the Canal linking Lake Boudreau to the marshes east of Little Caillou Road is the Ward 7 flood levee constructed as part of the Terrebonne Chauvin flood protection program. Research on New York's Sandy 2012 flooding showed that digging of major shipping canals, had worsened the impact of flood storm surges. I felt that the study site could raise important debates about tradeoffs as policy makers and citizen scientists research and debate the best solutions for sustainable flood management policies. 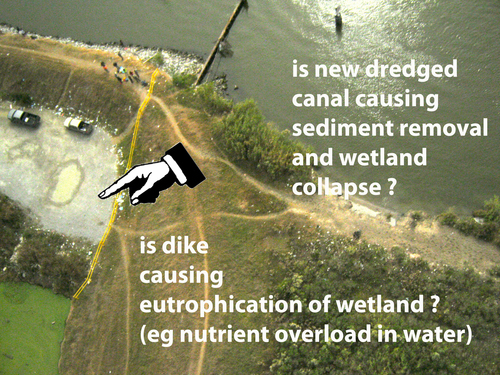 Does digging of canals and building new levees disrupt the sediment regimes, flood buffers and fish breeding values of historical wetlands ? Heavy cloud cover meant that image quality would not be sufficiently high to justify composite aerial map stitching. However fun could be still had. Here Liz is connecting an old Canon SD 880 "Hello Kitty" camera from Brooklyn who has survived two full immersions in the waters of New York City, including it's Gowanus Canal Superfund Site. Low level pictures are reasonable quality ..
A kite camera team walking along the Flood levee..
A key workshop discussion issue became the best times and light angles for flying the kite cameras. When was the best time to capture meaningful data that is underwater? 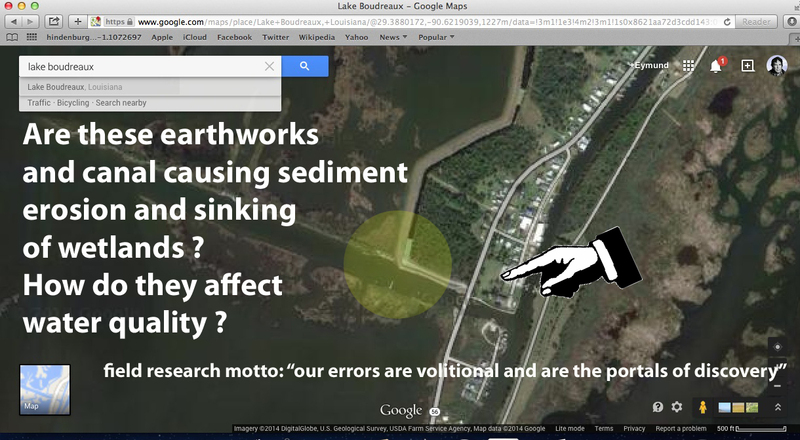 In this case we were looking for underwater sediment flow patterns in the adjacent canal. 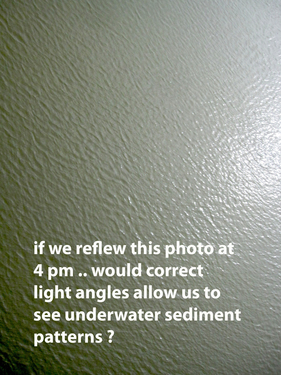 Because of the time of day, (around noon) strong glare off the water masked any of the water color and subsurface patterns we were interested in. 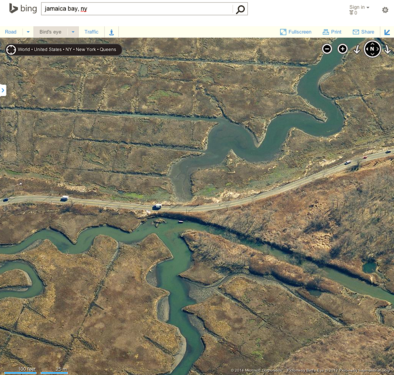 This example, taken from the Bing Aerials photo site, shows the difference correct light angles can make. 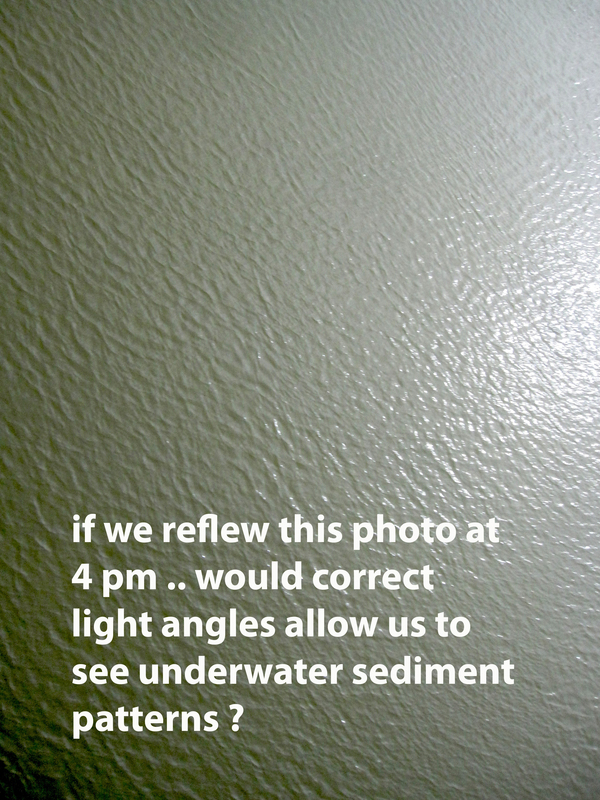 If the camera is flown later in the day, around 4 pm, with the sun hitting at a steeper angle in front of you, it becomes possible to capture sediment and deposition patterns. Timing for low tides also improves visibility. This sample from Jamaica Bay, in Queens, NY, behind JFK Airport, displays similar eutrophication patterns in the water that we observed in the Louisiana Ward 7 Levee site. Note how the marsh creek in southern section of photo, cut off by the road, displays more nutrient loading than the upper half of the photo, which is exposed to greater tidal flushing from Jamaica Bay. Our next technical challenge - testing various camera angles and flight times to capture under water sediment and flow patterns. Despite overcast conditions, the kite teams still managed to capture some thought provoking imagery. 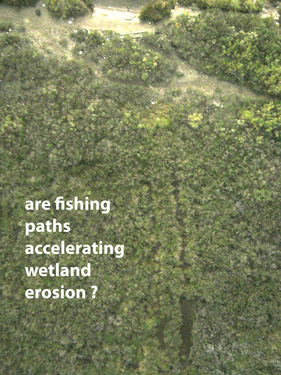 A research question to pursue is whether human paths through the fragile wetland ecosystems allow for initial landscape scarring, leading to breaches allowing for greater inland wetland loss. 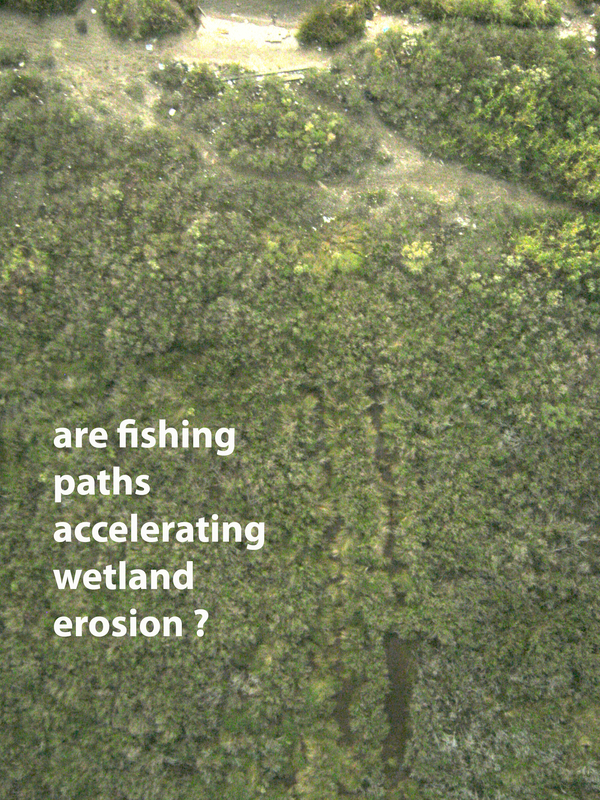 Do these human paths and roads over time become full blown wetland wash outs, contributing to their gradual conversion to mud flats? A more surprising issue was the dramatic impact the flood levees seemed to be having on duckweed type floating plants (Lemna minor) in the generally stagnant canals that were now cutoff from their historical water flow patterns. 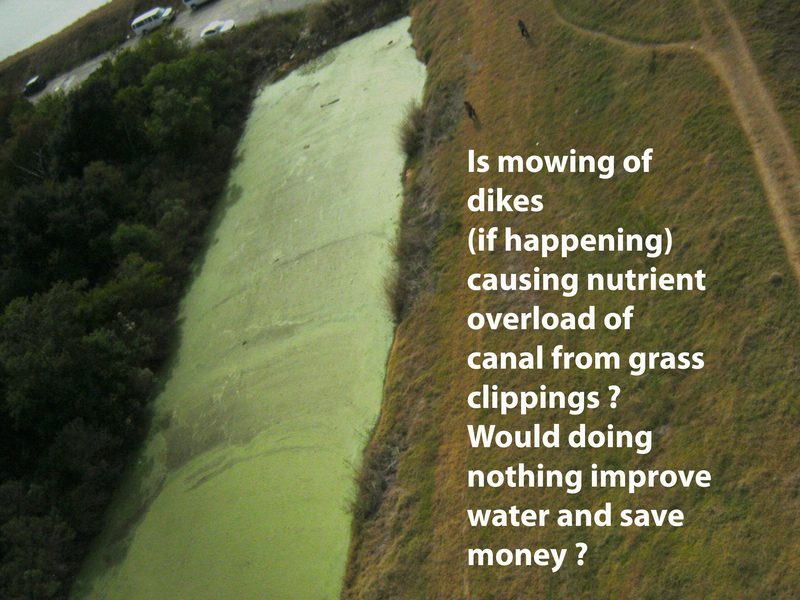 Another research question to pursue is where the nutrient loading is coming from that is causing the now blocked canals to turn green. If the levees were recently raised (around 2011) have the replanting or maintenance programs of the refurbished levees caused fertilizer or nutrient runoff to the adjacent wetlands and waters ? Because of duckweed's ability to remove nitrogen and phosphorus loading in the water, further research on practical applications of duckweed harvesting could be explored in the context of Louisiana's oil production trends. This sustainable fuels research would need to be balanced against impacts on fisheries and natural habitat resources. 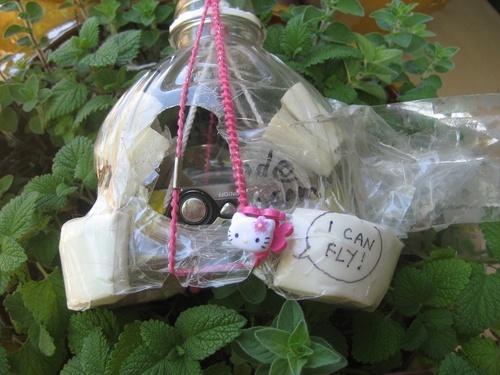 The "spontaneous process of discovery", where citizen scientists are given the tools to explore, has suddenly triggered a whole set of meaningful questions, whose cumulative "little pieces" take on a broader meaning. "And when it all goes quiet, I see they are right here. I see that I'm a little piece in a big, big universe. " 2014, 15 November, Chauvin, Louisiana. Kite Camera photo of weekend fishermen. @eymund i couldn't be happier that you came to Barnraising this year! What a great and informative note, with hilarious GIFs.